Some troops will extend their deployment on the southern border through Jan 31. The Defense Department statement did not say how many of the 5,600 troops currently deployed to the border would be required to stay, but two U.S. officials told ABC News last week that an extension could take form as a rotational deployment -- meaning different units would regularly rotate into the border support mission. The extension of troops could focus on California, given the thousands of migrants waiting in Tijuana across the border from San Ysidro. Some migrants could be in Tijuana for weeks -- if not months -- as they wait to apply for asylum. Last week, the Pentagon announced that 300 troops who were assigned to the border in Arizona and Texas were moved to California after assessments from U.S. Customs and Border Protection, bringing the total number of troops there to 1,800. (Jaime Rodriguez/Department of Defense) U.S. Customs and Border Protection conducted a readiness exercise at the Otay Mesa Port of Entry to prepare for any unlawful attempted breach. 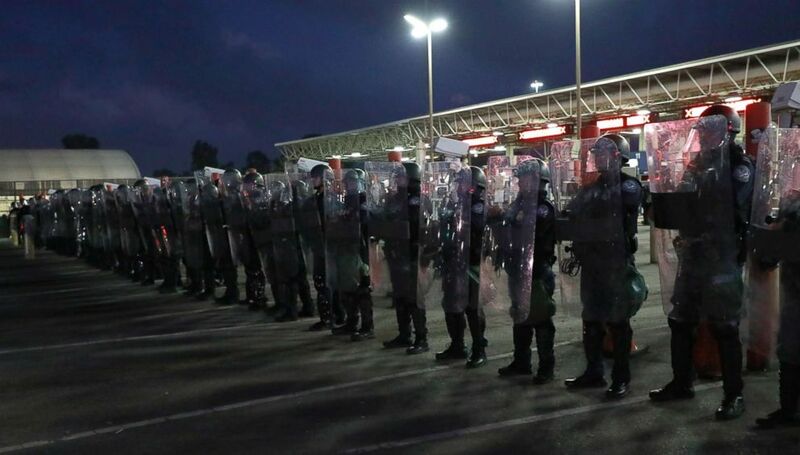 In late November, a group of migrants attempted to illegally cross the U.S.-Mexico border near the San Ysidro port of entry, prompting CBP agents to use tear gas and close cross-border traffic for several hours. Military Police units deployed along the California border are primarily acting as backup for those CBP agents. They are not armed and cannot act in a law enforcement capacity, the Department of Defense has said.